Kelly McCreary stopped by Home & Family TV to discuss the new season of Grey's Anatomy and her stylist Chris Horan posted her look on his instagram page. 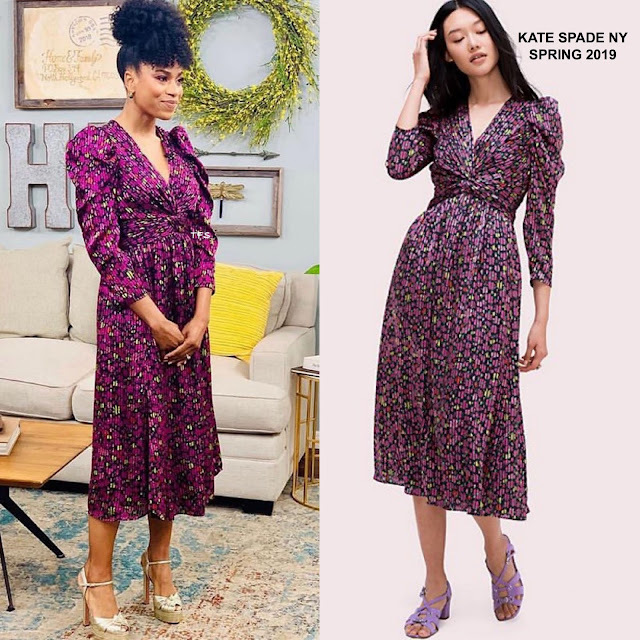 She posed for the gram wearing the KATE SPADE NEW YORK SPRING 2019 'Devore' marker floral dress, featuring an v-neck & twist detail bodice and semi-dramatic puffy, bracelet length sleeves. There's nothing that I would change or add here because Kelly looked simple amazing. Her feminine floral piece which was accessorized with APM MONACO jewelry and AQUAZZURA sandals, was the perfect look for her appearance. A flawless beauty look rounded out her look. Are you feeling Kelly's instagram style as well?